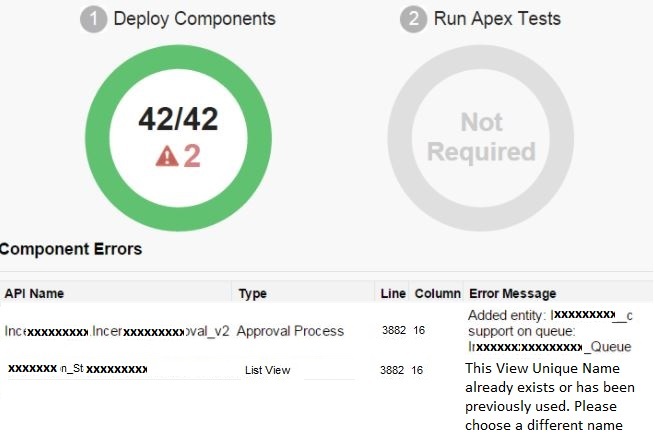 Change sets allows to deploy metadata between connected orgs. By using this, Admin can create the change sets and add the components to it and can deploy it to next org. It can be used to deploy metadata between sandboxes and from sandbox to production. Main challenge with change sets is mentioned below. If any error comes while validation using change sets then it stops validating other components. So we have fix the error and then again needs to validate it. But if we migrate metadata using ANT, then we get all deployment errors which help us to fix all errors in one shot. Deployment process using change sets becomes complex if it involves large number of different metadata. After introduction of lightning:tree, it is very easy to use this and implement this in short time. ltngcurrentRecId : Salesforce 15 or 18 digit Id of any record for which you want to see hierarchy. ltngParentFieldAPIName : Field API name which creates self relationship between records. ltngLabelFieldAPIName : Field API name which will be used to display records in tree structure(like Name, CaseNumber, Title__c etc.). ltngHierarchyHeader : Header label which will be displayed above tree structure. You can use this code as reference and can implement different logic. Looking forward for everyone's comments and suggestions. First error happens if you have list view on object which is shared with all internal users. If you remove below tags from exported metadata of list view, then you will not get this error. After removing these tags, I was able to deploy successfully. This error happens because your list view refers to queue and same queue refer to same object. Split your package for deployment because there is dependency between object, list view and queues. Deploy these three things separately. First deploy custom object with basic information. Remove list views tags from .object file before deployment. Create custom object manually in target org and deploy the package. This is best approach as you don't have to change any metadata files. Deployment errors also come if you deploy approval process which contains approver as queue and those quesues refer to same object on which you have approval process. So always first create custom object in target org and then deploy queues and then deploy remaining things. This webinar helps in understanding Einstein Platform Services. This is intended for Administrators and developers. If you missed this webinar then, you can refer below webinar recordings and slides. In this blog, we are going to create a sample app which will list 10 recents accounts from Salesforce and will view and edit account using Lightning Data Services. In the Developer Console, choose File > New > Lightning Application. Specify “LDSAccountListViewApp” as the app name and click submit. Specify below code in lightning app. In the Developer Console, choose File > New > Lightning Component. Specify “LDSAccountEdit” as the component name and click submit. Paste below code and Save the file. Click CONTROLLER in the right side bar of the code editor and replace code with below code and save the file. Update the “LDSAccountListViewApp” code with below code and save file. Lets see what we have done!!! In order to display more account fields, replace the code inside div with class “maincontainer” with below code. Click CONTROLLER in the right side bar of the code editor and add saveRecordHandler function and save the file. Specify “LDSAccountView” as the component name and click submit. Copy the code from “LDSAccountEdit” component and paste it here. Remove "handleRecordChanges" attribute from <force:recorddata> tag. Remove Lightning:button with label as "Save". Lets see what we have done!! Create Apex Class “LDSAccountListViewController” to fetch latest 10 Account records from your org. Specify “LDSAccountListView” as the component name and click submit. Update LDSAccountListView lightning Component. Replace <!--display all accounts--> section with below code and save file. Click CONTROLLER in the right side bar of the code editor and add onSelectMenuItem function and save the file. Update LDSAccountListView lightning Component. Now we are going to display LDSAccountView and LDSAccountEdit components based selection made by user on menu item. Add below markup code in LDSAccountListView component after the section for account list views and save file. In LDSAccountEdit component, add action to lightning:button with label as "Back". Click CONTROLLER in the right side bar of the code editor and add goBackToListViewfunction and save the file. Let see what we have done so far!!! So now we are loading account view and edit page using Lightning Data Services. I think this will help you to understand basic concept of Lightning data services. Below are list of items which can be implemented to for better User experience and for learning. You can add deletion of records using LDS. When you click on Save in account edit page, it should refresh the list view with latest changes. In this hands on training you have to refresh the browser to see latest values of account record. You can use "New Account" to create new account record using LDS. Hope this will help in basic understanding of Lightning Data Services!!!. In this blog, I am going to cover practice session to learn Salesforce Lightning Events concept. By end of this hands on training session, you will create an Lightning App which contains 2 different components and interacts between them by using Lightning events. Before starting this hands on training, set up you salesforce environment. Below are prerequisite for this session. Sign up for Developer edition ( https://developer.salesforce.com/gettingstarted ) if you don’t have. Enable My Domain in your org (Navigate to Set Up-My Domain). After registering My Domain, deploy it for all users. Specify “ApplicationEventDemoApp” as the app name and click submit. Specify name as “LightningEventsResources” and browse zip file. Specify “Public “ for Cache Control field and click on Save. Specify “IndependentHospital” as the component name and click submit. Specify below code in lightning component. Add this component in “ApplicationEventDemoApp” Lightning App and click on save and preview. Let see what we have done !!! Update the IndependentHospital component with below code to add some action to send ambulance. Click HELPER in the right side bar of the code editor and replace code with below code and save the file. Specify “IndependentCarAccidentNotifier” as the component name and click submit. Specify below code in lightning component and save file. Modify the in “ApplicationEventDemoApp” Lightning App code and click on save and preview. In the Developer Console, choose File > New > Lightning Event. Specify “carAccidentAppEvent” as the event name and click submit. Specify below code in lightning event and save file. Write Event handler in hospital component. Add below code in IndependentHospital component. Create an attribute to store msg send by event. Now preview the Lightning app and click on "Send notification vai App Events" button which will trigger ambulance in independentHospital component. 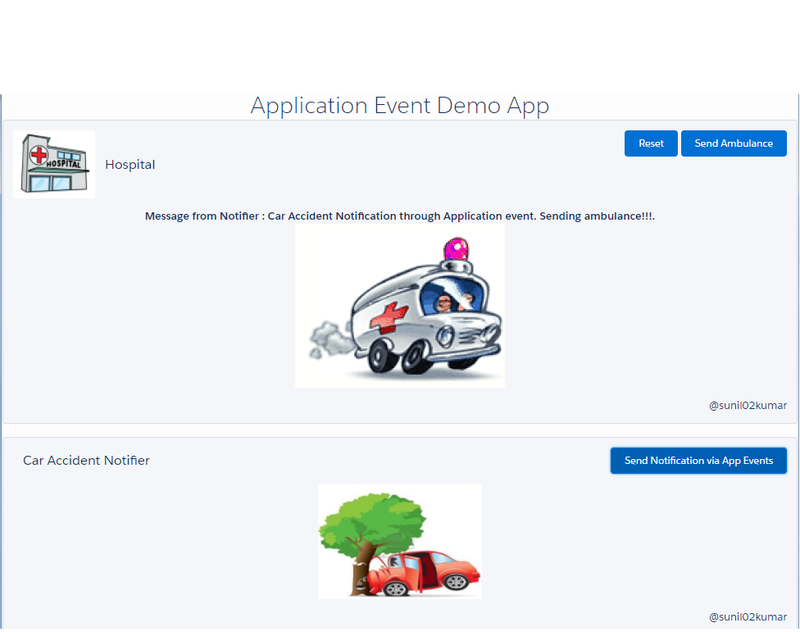 So after completing this, you will understand the concept of communication between 2 different components by using application events. Here I am going to explain difference between them along with code sample. Components events can be handled by same component or component which is present in containment hierarchy (component that instantiates or contain component). Below is syntax for creating component event. Make sure that name attribute is same as that of name attribute while registering the event. This kind of events can be handled by any component which is listening to it (have handler defined for event). It is kind of publish-subscribe modal. Below is syntax of creating application event. These events are fired automatically by the framework such as during component initialization, attribute value change, rendering etc. All Components can register for system events in their HTML markup. Few examples of system events are init, aura:waiting, aura:doneWaiting, aura:doneRendering etc. If app or component is rerendered, then init event is fired. If server side call is made in init then, aura:waiting event is fired. Once the server call is finished then aura:doneWaiting event is fired. After this aura:doneRendering is fired. Always try to use component events. Component event usage is more localized as these can be used by same component or component in containment hierarchy. If you use application events then it may fire system events. Use Application events only if components are present in 2 different app or are not in containment hierarchy. Today I got chance to speak in Pune Salesforce Developer Meet up about me journey from Salesforce Classic Development (using VF pages and VF Components) to Salesforce Lightning components. After explaining the Salesforce transition from Classic development to Salesforce Lightning framework, I covered Salesforce Lightning custom events followed by very simple Demo. Through this blog, I am going to share the presentation which i delivered today. This presentation also contains Git hub Repository URL which contains all code which was presented in Demo. Looking forward for everyone's comments and suggestions!! !